Lessons from Developing Countries” held in Guyana. Guyana lacks the capacity to deal with an expected huge influx of invoices from the United States (US) oil giant, ExxonMobil, is set to begin submitting in the coming months, even as industry experts on Thursday said invoices and payments by international oil companies must be examined in detail. Finance Minister, Winston Jordan is already on record as saying that he was unaware that ExxonMobil was about to dispatch invoices to Guyana as the country prepares to begin commercial oil production in 2020. Based on the production sharing agreement, ExxonMobil is entitled to 75 percent to recover the cost of investment and the remaining 25 percent of profit oil will be split in half between the company and Guyana. American attorney-at-law, Vicky McPherson, cited the need for governments to hire lawyers who are experts in the oil and gas sector, she said one of the options could be to ask the international oil company to pay the lawyers. Mc Pherson noted that such costs would be eventually recovered by the company, and so there is need to keep track of all expenses or a country could end up receiving far less than expected revenue. 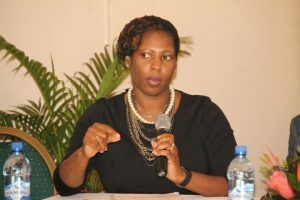 “It will essentially be recovered by the oil company as part of their accounting every year and this goes to the point of making sure that you have the accountants in government, in particular, where you can actually use the mechanisms that are included in the contract to ensure that the cost that the oil companies are trying to recover are legitimate costs which may again include your legal cost,” she said. Vicky Mc Pherson making a point at the workshop in Guyana. She explained that at the end of their accounting year, oil companies are allowed to deduct all of their costs or developing, exploration and production. “If you don’t have someone from your accounting department who is capable of making sure that those are legitimate costs then your percentage of the actual revenue goes down because you haven’t properly vetted the cost that they are trying to deduct,” Mc Pherson said. She gave as an example government officials travelling overseas to negotiate would be a deductable expense by the oil company. 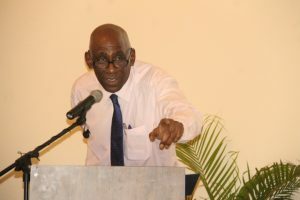 Geo-scientist and former Trinidad and Tobago Minister for Energy and Energy Industries, Eric Williams said in some instances an accountant does not necessarily specialise in oil and gas which could result in auditors “auditing things that they can’t even pronounce” and engage in calculations that they are unaccustomed to. British security expert, Dr. Perry Stanislas urged participants to mount robust negotiating teams instead of being vulnerable to counterparts who either come very prepared without lawyers or are part of a team that is willing to engage in distracting tactics. On the matter of negotiations with oil companies, geo-scientist and former Trinidad and Tobago Minister for Energy and Energy Industries, Eric Williams strongly advised against leaving out local lawyers from negotiations with international oil companies. Stanislas said oil and gas revenues could either help to heal the nation by addressing social and economic inequality or fragment it to the point of instability. “If oil revenue is managed correctly, it helps to erode tribalism, it helps to erode ethnic differences,” he said. The symposium is organised by the Caribbean Institute of Forensic Accounting, Guyana Oil and Gas Association and the African Business Roundtable.